In a world where there are kitchen gadgets for just about everything, I’ve come to the realization that a few simple, high quality items suffice just fine. This after many years of being sucked in by slick marketing pitches touting the virtues culinary gadgets, which have spent more time buried in my cupboards then they have in use. Yes, we’ve all at one point felt like we just had to have a banana slicer, quesadilla maker, pickle picker, egg and muffin toaster, and of course an asparagus peeler. They just sounded so essential at the time. They all end up on a garage sale table priced at $1 or best offer, only to end up in the hands of the next sucker. With that, I find myself utilizing the same basic kitchen tools over and over and came up with a list of 10 that are essential to my success in the kitchen. I’ll start with the Le Creuset 7 quart round cast iron Dutch oven. If I could only have one pan, this would be it. Besides being a beauty of pan, one that has a permanent place on my stove, it is by far the most functional and versatile pan I’ve ever owned. It works well on all heat sources including induction and is oven safe. 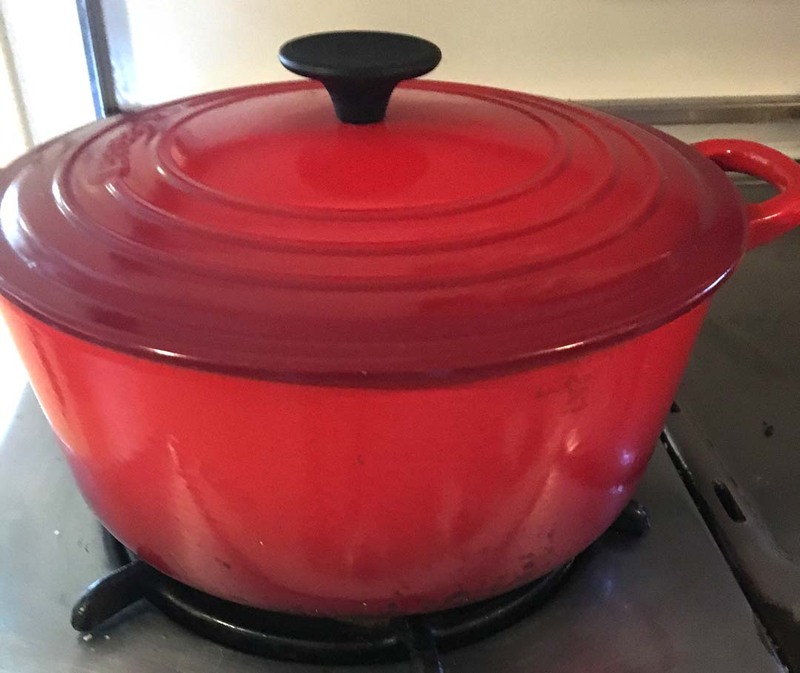 It’s ideal for making soups, rice dishes, casseroles, roasts, one pot meals, baked recipes, desserts, frying up a steak or burger, poaching seafood, I could go on and on. It provides even heat distribution and amazing heat retention and is made using enameled cast iron so it’s resistant to chipping and cracking. It has a sand-colored interior, which makes it easy to monitor food as it cooks to prevent burning and sticking and it’s lid traps heat and seals in flavor and moisture. The 7-quart is my preferred size but they come in a variety of sizes and colors. So yes, this is my desert island pan, the foundation for my kitchen and well worth the investment. skillet. This is another versatile cooking tool and one that I’ve found is my preferred method for cooking a steak or burger to your desired temperature that can prove difficult on an outside grill. The keys to cooking meat on a cast iron skillet are room temperature meat and a very hot skillet. Combine those two elements with some salt and pepper and some kind of animal fat to coat the pan and you are good to go. A basic saucepan is key to the mix and if I’m going with one, it’s of the 3-quart stainless steel variety with a lid. There are many price points and quality levels in this category, but I’ve never paid over $40 for one and the Cuisinart version I’m using has held up fine for years. And while I like to think I could utilize my cast iron skillet for all my frying pan needs, having a nice non-stick pan with a lid is a treat especially when eggs are involved. I went with a mid-range Calphalon 12-inch version and again, the extra money spent was worth it for the quality. A quality knife set has always been a part of my kitchen mix and there are only 3 that I’ve used consistently. A classic chef’s knife is the most important knife in my collection. An 8- to 10-inch chef’s knife is perfect as the longer edge makes the knife more versatile and efficient it is. A chef’s knife is the go-to tool for more than 90 percent of daily kitchen tasks. My paring knife picks up where a chef’s knife leaves off. It’s best for slicing and mincing items that are too small for an 8- to 10-inch blade. Because the average paring knife blade is about 3-1/2 inches long, it’s a great tool for any foods that require an attention to detail. A serrated knife may be most commonly associated with slicing bread, which is why they are also called bread knives but they are especially useful for foods with waxy surfaces, as the jagged edge can grip and penetrate those slippery exteriors. I’m counting my kitchen utensil container as an essential item that is filled with several key tools. Those would include a wooden spoon, metal and plastic spatula, plastic tongs, pasta scoop, whisk, grater, potato masher, slotted spoon and a timer. I’ll round out my list of 10 with an enameled steel strainer, coffee grinder, blender and yes; I’m including my Nutri-Bullet. It may sound gimmicky but it’s almost completely replaced my blender and it is so convenient and powerful that healthy smoothies have become a quick and easy part of my mornings. I could survive on less, and yes, there are more items than that in my kitchen, but if I were limited to 10, I could get by just fine with those.